Birth Name: Walker Smith Jr.
Sugar Ray Robinson, born Walker Smith Jr. is recognized as one of the greatest boxersof all time. He is frequently listed at number one on the list of top boxers by boxing aficionados. Sugar was 85-0 as an amateur and 69 of those victories came by knock out or TKO. As a holder of many boxing records, Robinson was the first boxer in history to win a divisional world championship five times; a feat he accomplished by defeating Carmen Balliso in 1958 to regain the world middleweight title he had lost to Basilio the previous year. Robinson also held the world welterweight title from 1946 to 1951. Many boxing fans and critics regard Robinson as, "pound for pound, the best boxer of all time. Muhammad Ali who repeatedly called himself "The Greatest" throughout his career, has said without hesitation that, while he does consider himself the greatest heavyweight in boxing history, that he would rank Robinson the greatest fighter of all time. Other all time greats like joe louis and sugar ray leonard have said the same. Robinson made his professional debut in 1940 by knocking out Joe Echevarria in 2 rounds. In 1941 he defeated world champion Samm Angott, future champion Marty Servo and former champion Fritzie Zivic. The Robinson-Angott fight was held above the lightweight limit, since Angott did not want to risk losing his lightweight title to Robinson. The Robinson-Zivic fight, according to Robinson, would be the toughest fight of his career. In 1942 Robinson was named "Fighter of the Year" after winning rematches against Zivic, Servo, and Angott, winning a decision over Jake LaMotta, and winning a total of 14 fights with no losses. On December 20, 1946, Tommy Bell, who Robinson had once beaten by decision, was matched against Robinson for a second time in New york City for the world welterweight title, which had been vacated by Servo, who by that time had himself lost to Robinson, twice. In this rematch, Robinson, who only a month before had been involved in a 10 round brawl with Artie Levine, was knocked down by Bell. The fight was called a "war", but Robinson was able to pull out a close 15 round decision, winning the vacant welterweight title, a title he had long sought to capture. In 1947, Robinson defended his title for the first time by knocking out Jimmy Doyle in the eighth round. Before that fight, Robinson had a dream that he was going to accidentally kill Doyle in the ring. As a result, he decided to pull out of the fight. However, a priest and a minister talked to Robinson and convinced him to go ahead with the bout. Robinson did just that and, unfortunately, Doyle died from the injuries sustained in the fight that night. Robinson said that the impact of Doyle's death was "very trying." 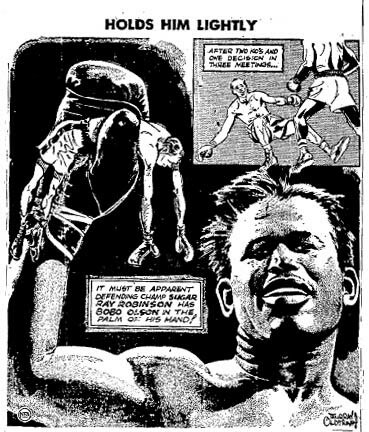 In 1948, Robinson fought five times, but only one bout was a title defense. Among the fighters he defeated in those non-title bouts, was future world champion Kid Gavilan in a close, controversial 10 round fight. In 1949, he boxed 16 times, and again only defended his title once. In that title fight, a rematch with Gavilan, the challenger was again beaten on points. The first half of the bout had been very close, but Robinson asserted his dominance in the second half, and Gavilan would have to wait two more years to begin his own historic reign as welterweight champion. The only boxer to match Robinson that year was Henry Brimm, who fought him to a 10-round draw in Buffalo. 1950 brought 19 fights to Robinson. He successfully defended his welterweight title against Charley Fusari, which would be Robinson's last defense of that title. Robinson won a lopsided 15 round decision, knocking Fusari down once. This last defense of his title ended the reign of the man many consider to be the best welterweight champion of all time. Robinson that year had previously beaten Robert Villemain to receive the Pennsylvania state world middleweight title. Later that year, in defense of that crown, he defeated Jose Basora, who had previously drawn with Robinson, and defeated Carl Olson; a future title holder at that weight whom Robinson would meet and beat four times. Robinson's 50-second knock-out of Basora in the rematch set a record that would stand for 38 years. On February 14, 1951, Robinson and LaMotta met for the sixth time. The fight would become known as The St. Valentine's Day Massacre. Robinson won the undisputed world middleweight title with a 13th round technical knockout. Robinson out boxed LaMotta for the first 10 rounds, then unleashed a series of savage combinations on LaMotta for three rounds, finally stopping the champion for the first time in their legendary six bout series. This bout, and some of the other bouts in the six-fight Robinson-LaMotta rivalry, was depicted in the Martin Scorsese film "Raging Bull". After winning his second world title, he embarked on a European tour which would take him all over the Continent. During his fight in Berlin against Gerhard Hecht, Robinson was disqualified after hitting his opponent on the kidneys. The fight was later declared a no-contest. In London, he lost the world Middleweight title to Randy Turpin in a sensational bout. Many felt that Robinson was not in proper condition for the fight. Three months later in New York, he knocked Turpin out in ten rounds to recover the title. In that bout Robinson was leading on the cards but was cut by Turpin. With the fight in jeopardy, Robinson let loose on Turpin, knocking him down, then getting him to the ropes and unleashing savage punches on him, causing the referee to stop the bout. Robinson would again win the "Fighter of the Year" award for 1951. 1952 brought the second bout with Olson which ended in another victory for Robinson, by decision. He would later face and defeat former champion, Rocky Graziano, in a 3-round thriller. Later that year, he challenged world light heavyweight champion Joey Maxim at Yankee Stadium. Robinson built a large lead on the cards, but the 104-degree temperature inside the ring took its toll. The referee, Ruby Goldstein was the first victim of the heat, and had to be replaced by referee Ray Miller. The fast-moving Robinson was next, and at the end of round 13, Robinson collapsed from the heat and failed to answer the bell for the next round, and suffered the only knock-out of his career. After that bout, Robinson retired with a record of 131-3-1-1. Robinson spent much of his retirment in Franceas a tap dancer. Later, in 1955, he returned to the ring. He won five fights, but the "ring rust" was still there, and he lost a decision to Ralph 'Tiger' Jones He bounced back, however, and after defeating Rocky Castellani by a split decision, he challenged Bobo Olson for the world middleweight title. Olson had been a solid champion during Robinson's absence, but Robinson retained his dominance over Olson, and won the middleweight title for the third time with a two-round knock-out, defeating Olson for the third time. They fought for the last time a year later, and Robinson closed the four fight series with a fourth round knock out in 1956. In 1957 he lost his grip on the crown against Gene Fullmer. Fullmer's wild, aggressive style gave Robinson trouble, and Robinson was knocked down in the fight. Robinson, however, noticed that Fullmer was vulnerable to the left hook. In the rematch, Fullmer again aggressively stalked after Robinson, and the fight was very even for five rounds. But in the fifth, Robinson was able to win the title back for a fourth time by knocking-out Fullmer with a lightning fast, powerful left hook. Boxing critics have referred to the left-hook which knocked out Fullmer as The Perfect Punch. Gene Fullmer took Sugar Ray Robinson's Sunday punches for 15 murderous rounds last night and then proceeded to take Robinson's world middleweight title. The glamour attached to Robinson's name drew a pre-war crowd of 18,134 into Madison Square Garden and in effect it watched two triumphs. The first belonged to the wonderfully strong young welder from West Jordan. Utah; the other went to the old fellow with the scythe who has taken out better men than Sugar Ray and will continue to do so. He robbed Robinson of the superb timing that had compiled: such an illustrious record in a 140-fight career. He sapped the spring from Robinson's legs. He turned Robinson, at 35 or 36, depending on who you listen to, into a tired old man, fistic-wise battling desperately against a rival who knew no weariness, who absorbed Robinson's best combinations, who shrugged off a dozen of booming rights to the heart. There was no question about who won this one even though there was some booing at the end. It was unanimous on the part of: both judges and Ruby Goldstein, the referee Frank Forbes had Fullmer the victor, 10 rounds to five. The other judge. Harold Barnes had it 9 and 6. Goldstein scored it 8 and 5 and 2 rounds even. The New York Herald Tribune's scorecard had it eight and seven for Fullmer, with the last round going to Sugar Ray despite his harrowing appearance, bloodied from a cut over his left eye and completely punched-out against a rival who was 10 years old when Sugar Ray had his first professional fight. THREE TIMES Sugar Ray had been the middleweight champion of the world. There is a return clause in the pact under which last night's bout was fought, a 90- day stipulation. Ray may try for no. 4 some time this spring, but the movies of this one could have a sobering effect upon, him. For risking and losing his title, Robinson enjoyed quite a pay-night. He got 47 ½ per cent of the gate of $194,645. and $60.000 of the $100.- 000 paid by the TV sponsors. The fight was blacked out in the New York and Philadelphia area. The crowd, sensing perhaps that this c o u l d be the last topflight appearance of the Robinson that had thrilled almost two decades of fight-goers came early. It filled the gallery an hour before the fight. It proved the biggest turnout since Bobo Olson fought Randy Turpin here three years ago. It was Sugar Ray's first New York fight in more than four years. If it was his last, he had this consolation: a rush of Robinson money switched him around to a 6-5 favorite at ring time after the price had dropped steadily from an 8 to 5 a few days earlier for Fullmer. Fullmer fought for a flat 12 ½ per cent of the gate, and TV revenue was just a vagrant thought as far as he was concerned. If there was any animus in his soul because of the lopsided financial arrangements, or because Robinson had caused the fight lo he postponed from Dec. 12 because of illness, there was sweet revenge for the westerner. He knocked Robinson down For a six-count in the seventh round; he spun him around like a preliminary boy. He shook off Robinson's booming rights to the body and pressed the attack continually. When Robinson sought to tie him up in close, Fullmer was so strong he simply pulled his arms away and kept up the flailing attack, an awkward appearing style in which he rested his head on Robinson's chest and threw punches from every angle. One of these caught Robinson over the eye in the sixth or seventh. The slight cut didn't bother him until the last two rounds. Then Robinson underwent the unique experience he had inflicted on so many past opponents fighting with blood dripping into his eye in vision- obscuring fashion. Fullmer was on the canvas, too.at one stage in the fight but it was while locked in Robinson's embrace. Both fell heavily over the lowest rope just as the sixth round ended. The fall ripped the rope away from its mooring on the opposite stanchion. Emergency repairs gave the battlers an extra minute or two rest between rounds. When it gave further trouble a round or two later Goldstein ordered the lower strand removed entirely. eye. The reflexes weren't there; the championship passed to the younger man, and with it an opportunity to make a sizeable sum in his future pugulistic endeavors for Fullmer is the kind of a fighter the crowd likes to see. He can take a punch, as he demonstrated last night; he can slug with the best. When Robinson punched in dazzling fashion, moving his hands in those ominous piston-like movements that had taken out so many opponents, Fullmer went right along with him. It was Robinson who broke off the jousting. When Robinson's slashing uppercuts failed lo rock Fullmer the old champion was observed moving his lips, talking either to himself or to his opponent, something never before noticed in any of his fights. The loser and old champion took his defeat like a man Wednesday night, disclaiming alibis, but Ray Robinson's managers were loud in their criticism of Gene Fullmer's tactics and the refereeing of Ruby Goldstein. Seated on a table with his back to a wall, the dethroned Sugar Ray, showing no signs of his vicious 15-round battle with the kid from Utah except an inch-long gash over his left eye, flashed his big smile and tried to answer questions above the chorus of wails from his board of directors. It became embarrassing to Robinson finally, and he broke in to say positively: "Understand, I have no squawks against Goldstein, Fullmer, or anybody. The only thing I will say is I thought rabbit punching was against the rules. Sugar Ray declared he never was hurt by the surging Fullmer, whom he described as a rather awkward fighter who would swing a couple of punches as he came in, and then get in close and maul. Sugar Ray said he couldn't answer any questions on his future plans—whether he will fight again —but he left the door open by adding: "After all, fighting is my business." He sized up the fight pretty well when someone asked him what he thought cost him the fight. "Fullmer," he answered candidly. world middleweight championship from Randy Turpin of England tonight on a technical knockout at 2:52 of the 10th round before a turnaway crowd of 61,370 at the Polo Grounds. Referee Huby Goldstein stopped the bout when Turpin was being battered helplessly on the ropes after he had risen from a nine-count knockdown. The end came with unexpected suddenness at a time when the coffee-colored muscle-man from Leamington, Eng., appeared to be taking command of the fight. Only a few seconds before Turpin was floored In the 10th session, he had reopened a gash in Sugar Ray's left brow, and It was streaming blood when Robinson suddenly began the assault that enabled him to win back the 160-pound title Turpin had won from him on a decision at London, July 10. It was in that July 10th bout that Robinson had suffered the 10-stitch gash that reopened tonight. Robinson, 31, was given a thunderous ovation by the largest crowd to witness any fight since the war as he achieved the quickest recapture of the crown in the 84-year history of the middleweight division. Sugar Ray won it back in 64 days, beating the former regaining record of 80 .days achieved by the late Stanley Ketchel against' Billy Papke in 1908. Tonight's return bout, which grossed $767,630 at the gate was exciting in most sessions although Turpin's trip to the canvas in the 10th round was the first in the bout.In the second session, Randy almost went to the canvas when his knees buckled from the explosive force of a straight right to the chin. In the 10th round, a straight right to the Jaw staggered the dusky Briton. Then Robinson barraged him with left and right hooks to the head and chased him Into the ropes.They came off the ropes and a hard right to the chin dropped Randy flat on his back in mid-ring for a count of nine. Randy rose groggily, and Robinson went after him with a terrific assault that again drove the nearly helpless Briton into the ropes. On the ropes, Robinson smashed him in his bobbing face with more than 20 blows before a final left hook brought him lurching off the ropes and into the arms of Referee Goldstein. Robinson was ahead on the score sheets of the two judges going into the 10th round; but Referee Goldstein had the fight even then. Goldstein had scored four rounds for each and one even.Turpin, who had been falling behind after an excellent first round, suddenly began to lake command in the eighth session with a punishing barrage of hooks to the body and head at close quarters. In the ninth, Randy became angry when Robinson hit him two right hooks as they were breaking from a clinch. Though Robinson apologized for the illegality, Randy gave him a severe drubbing as he forced Sugar Ray about the ring. Because of the momentum Turpin had worked up In the eighth and ninth sessions, he was regarded as "nearly home" when he reopened the brow gash In the 10th—just before the sky fell in on him. Turpin, 23, said he had lost to a "good sportsman." But most American boxing men regarded Turpin as the "good sportsman" because he had gone through his first title defense and lost it in the second fastest time for any champion in ring history. He lost it in 64 days. Featherweight Eugene Criqui of France won the title from Johnny Kilbane on June 2, 1923, and lost it to Johnny Dundee 54 days later. Turpin scaled 159 pounds, just one under the middleweight limit, Robinson registered 157 ½ . He appeared stronger than at the 154 1/2 he had weighed at London in July. It was because of that off- , weight at London and his claims of being stale, that Sugar Ray had gone into the ring favored at 12-5 tonight. The crowd was the largest to attend a fight anywhere since the second Joe Louis-Max Schmelling bout at Yankee Stadium in 1938. Joe and Max drew 70,000 customers. Robinson, registering his 129th victory and his 85th knockout in 133 professional fights, tagged young Turpin with the second TKO of his career.Randy had been forced to retire in the 5th with Jean Stock of France because of a broken right hand in 1948. However it was Randy’s third defeat in 45 professional bouts. Robinson receiving 30 per cent of the net proceeds from the total gross of at least $1,092,630 should get at least $250,000, Turpin getting 25 per cent should garner about $210,000. Fighting out of a crimson haze through the last 12 rounds, Carmen Basilio attained his goal of the world middleweight championship by outpointing Sugar Ray Robinson in a blistering 15-rounder in Yankee Stadium tonight. This was a rip-roaring battle between a boxer and a bulldog, and although Robinson's rapier left found the mark early to cut Basilio alongside the left eye, Carmen kept coming back so strongly that Robinson showed' signs of discouragement through the middle rounds. Basilio won it on sheer determination, because it seemed' in the 12th round that only determination was holding him up as Robinson went all out to finish the groggy welterweight king. Then, however, Carmen rallied in amazing fashion, taking a big margin in the 13th to offset Robinson's biggest round. Actually, Robinson surprised with his stamina. He may have been inclined to hold Basilio lightly, and his training indicated that, but Carmen taught him respect early. Through the middle rounds. Basilio was setting up Robinson for thudding left hooks to the jaw, but Robinson was still strong enough to hold off Carmen,.who was too smart to go berserk against his dangerous foe. When Robinson tagged Basilio in the 12th, seemed to have him on Queer Street, and couldn't finish him, it seemed, to be Sugar Ray'slast bolt, although both were too tired to muster a real rally through the last two rounds. Announcer Harry Addie carried the suspense to the last.possible moment. He announced the vote of. Judge Artie Aidala, -who voted nine rounds to Basilio, five for Robinson, and one even. Then he announced the vote of referee Al Berl who had it almost diametrically opposite, nine for Robinson, six for Basilio. That left it up to the vote of Judge Bill Recht, with a split decision assured. Addie announced ; judge Bill Recht votes eight,six and even for the new middleweight champion of the world Carmen Basilio.